If you search the Internet you can find many interesting articles on Kale. Recently, there have been claims that eating Kale may suppress thyroid function, or in medical terms cause hypothyroidism. DrFuhrman.com writes in his article “Do Cruciferious vegetables Harm the Thyroid?” that some studies indicate that Glucosinolates (GSLs) breakdown products may “interfere with thyroid hormone synthesis or compete with iodine for uptake by the thyroid.” However, it is important to note that “the scientific consensus is that cruciferous vegetables could only be detrimental to thyroid function in cases of iodine deficiency or insufficient iodine intake.” It seems that in the majority of the population who do not suffer from iodine deficiency, Kale is probably harmless. I love Kale because it is a very challenging ingredient to cook. As Kale is best complimented by poducts rich in iodine, I searched the web to compile a list of such products. This is a short list: seafood, sea vegetables, asparagus, carrots, tomatoes, mushrooms, and egg yolks. 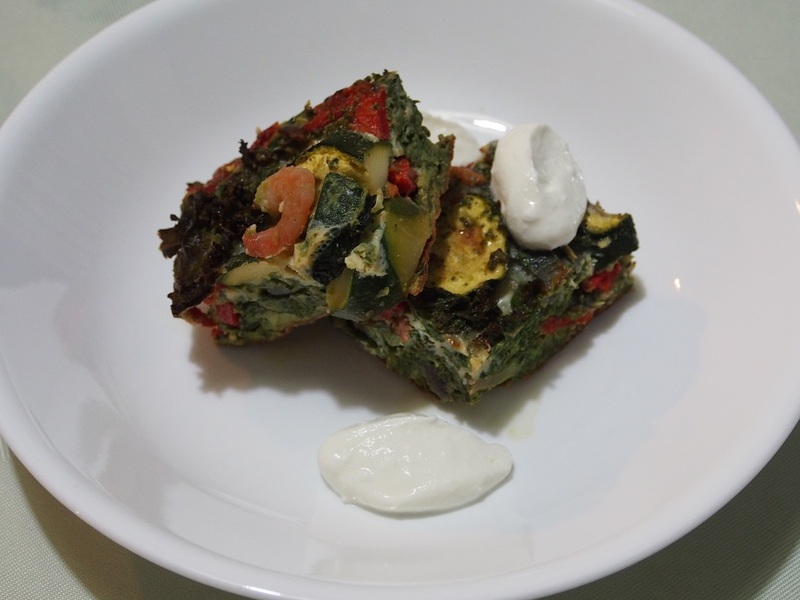 The idea behind this Kale Fritata recipe was to create a dish with lots of Kale and lots of iodine containing products. Over the weekend I posted a Kale Pudding recipe where I recommended to use Cod, Mackerel or Sardines. This is because they contain a higher level of iodine compared with other fish. 2. Once the oven has heated up, bake whole capsicums for 15 minutes. 3. In the meantime, process one batch of Kale leaves with 3 eggs until no whole leave pieces left. 4. Rip the leaves from the other batch of Kale into small pieces (approximately 2cm), dice onion, cut mushrooms into segments, coarsely cut zucchini and break asparagus stalks into 2cm pieces. 5. Once the capsicums are baked, let them cool so they can be handled, then discard the skin and seeds, and cut the flesh into 2cm pieces. 6. 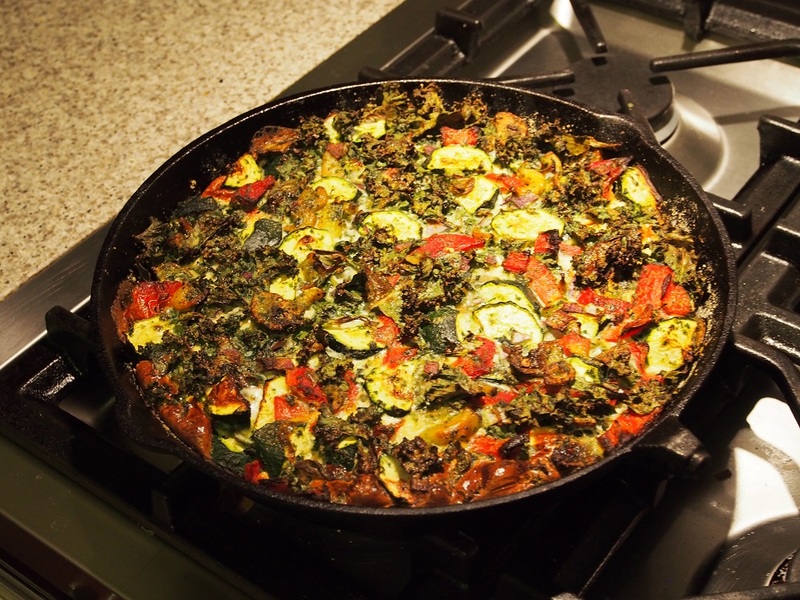 Spray a Quiche baking dish with oil and dust with Besan flour, so the surface is covered consistently. 7. Save 2 eggs, 1/4 cup of fish stock and 1/4 cup of rice flour for later. Thoroughly mix all of the other ingredients, this is easier to do in a large bowl. Then transfer the mix into the prepared baking dish. Take a flat plate and press the plate onto the contents of the baking dish for a few seconds or until the surface is even and the content is set. 8. Beat remaining eggs, stock and rice flour with seasoning and evenly pour the mixture over the surface of the frittata. 10. Let it cool and cut into 16 pieces, 2 pieces per serve.